The Bluebirds are Nesting...: Feather Your Nest Friday, 30th November, 2018. Feather Your Nest Friday, 30th November, 2018. The last day of November!! Once is is December Christmas is here! This was a MUCH better week. Thank you for the overwhelming and beautiful response to the prayer request. I can report that J is home from hospital and doing well. There have been some very promising signs and good days. If you will keep her in your prayers for healing from her past trauma that would be wonderful. Her Mother is very grateful to you all. I had left over strawberries that needed action fast. They made up on lovely jar of jam. Over a year all my little batches of jam add up! 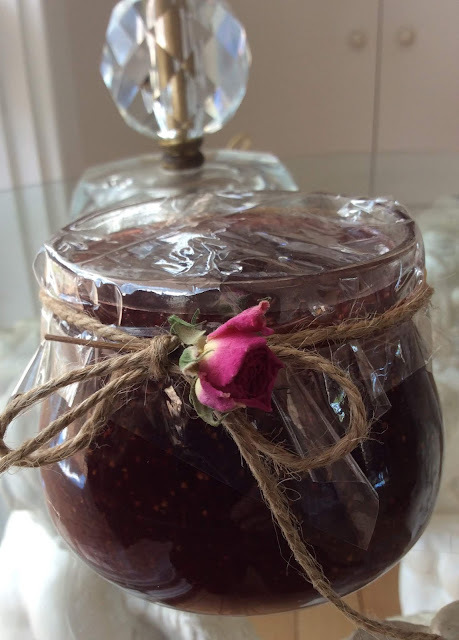 I can always but together a basket of different jams for a gift. I used one of my tiny dried rose buds as decoration. During the week I used a dried rose bud and string when wrapping a birthday present and it looked so pretty. We took a day trip to the farm that Lucy and her family are moving to in January. It is two hours south of here. It was a beautiful day and such a pretty drive. First there are vineyards and roses along the sides of the road that just go on and on. There there are pine forests. We took a picnic with us. We saw Emus running between the pine trees. Half way is a town which is my main regional town for shopping etc. This is where we pick up mail that needs a signature (other mail comes to our post box out the front) and the town is so nice. It is like stepping back in time. Gentlemen open the door for you, everyone chats. I love it! At at farm in the south we had a good walk around. The home is a huge old homestead. There are roses everywhere. Obviously I picked some!! There were two huge fig trees covered in the largest figs I have ever seen! They were not quite ripe enough but I think maybe two weeks and we will go back because we also found a cherry tree, covered in cherries!! I am guessing two weeks on those too. So if we plan a picnic we could come home with a car load of fruit and flowers! During the week I went over to Mum and Dads. 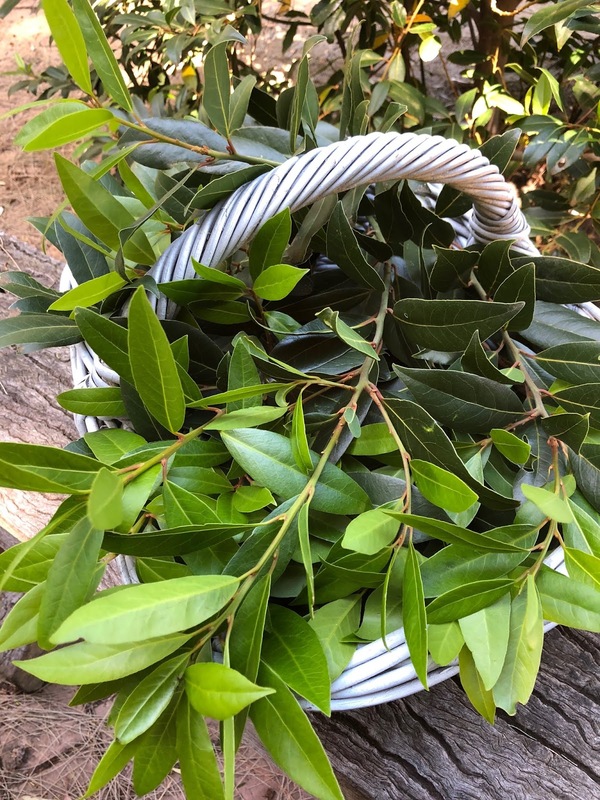 I picked a big basket of fresh Bayleaves. I am drying these to package up as gifts. Most cooks use Bay Leaves.... they are full of goodness and expensive to buy. And Mum's are organic! I made a cheesecake in the slow cooker. We have a hose dripping on one fruit tree at a time. I move it every evening to the next one. While I am there I inspect the trees. Each night I can see that fruit growing! Andy bought a cupboard in a second hand store. While there I was looking at a pile of bags... they were like a shoe or veggie bag and very old. A very fine cotton like a voile. 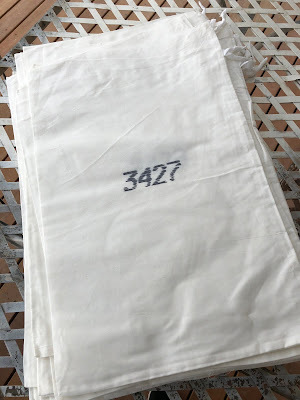 Each had a number stencilled on it. I was jus thinking mmm what could I do with these? The man said to me do you like them? I expressed my interested in using them to make SOMETHING and he said "here take a heap!" and handed me a pile. The pile turned out to be 22 of them. I am going to make Santa sacks and gift bags from them. This week we had our first Kangaroos in the paddock out the front. First there was a huge one hopping across the paddock. Then a smaller one. The next day the smaller one was back and came up close to our yard. I cooked a big pot of spaghetti sauce. I don't need to cook tonight and have some for Chloe and Luke as well. Janine very helpfully sent me photos to show me what a bakery is charging for very small fruit cakes. Cleverly she put her purse next to the cake to show just how small this cake is..
Look at the price! A cake a little bit bigger is shown in the next photo. This is so good to see. We constantly under value the gifts we make. When I work out my savings for the week I try and guesstimate how much I saved on the things I made. Keeping up to date on prices is helpful when doing this. It gives us an idea of the enormous savings to be had. Thank you so much Janine! Next time you make a tray of scones, biscuits, cakes... calculate what they would cost to buy! I did some Christmas wrapping. Some of my essential oil gifts are now wrapped and ready. I had saved nice little boxes to package them up in. I worked on my crochet edge kitchen towels and got a few more finished. I am also learning a new stitch so I can make decent looking hand towels and face washers from crochet cotton. Maria's daughter is having a C section to deliver her third baby next Friday. She has had a lot of trouble with her past babies deliveries so they are feeling nervous. Anyone who will pray for that family please do as they have had a very hard year but they have a Christmas baby coming! Tomorrow Chloe and I are heading off to a small town that is having a Christmas market. The tiny market I went to a few weeks ago was just wonderful. This one is miles bigger! It seems everyone has a side line, grows, makes and sells something. I am so excited! The last market I met three people I have kept in touch with and that have made me things to help my own Christmas crafts. One make me labels for bottled gifts, one made me gorgeous essential oil bracelets. I hope to get lots of ideas and maybe come home with some seedlings and who knows what else! This will also be a change to explore a town not too far away which will be really good. How did you feather your nest this week? I hope you found some savings, got ahead somehow and found a way to add to your pantry. Dear Cath, I am really happy to think your dream is going to come true! I knew you dreamed of this for a long time. Cath it is a game changer! Everything is different. A trip for Christmas is a wonderful gift!! How exciting! You have a lot to look forward to and plan! Yes our big cook ups and cakes etc... I also make giant Christmas cakes... they weigh a lot. The mind boggles what they would charge for those! I also start "real Christmas" on Dec 1st. I do make cakes earlier but I decorate from the first. The market was great!!! Good idea on the post!! I have another country twilight Christmas market Friday night. REALLY looking forward to it. I could combine what I see and learn from both! Certainly today I got ideas... saw what people are charging, what seemed to be selling well and things like this. Thanks for the idea as it is information useful to both gift giving and income earning. Thank you ... J's Mum told me she is amazed by her improvement even that it seems impossible and her Doctor is also amazed. So please keep her in your prayers as it has been a long haul for her and I think she needs continued prayer. I really appreciate this. I am so sorry about your husbands job. But I am thinking it is good to know now. The shock of going to work and coming home that day with no job would be so bad... this is bad enough but the warning is something and gives you time to plan ahead. Now I hope he will find another job quickly. Stocking up on major sales is the way to go. After Christmas we usually have some good specials and also after New Year. I save for those. Hilde is a good cook! Scones are amazing. They are cheap and a hit with everyone. Fast too. If visitors come scones are great. I managed to bake 6 Christmas cakes and steam one pudding this week. I really wanted to get it done before December, and I did! 4 of the cakes are for gifts, and the rest are for us to eat and share with friends when they visit. I can’t believe the price of the bakery cakes, for the size, mine are 20cm round, but really high, they weigh 2kg each! Also this week I deep cleaned the lounge room ready for Christmas. We moved all the furniture out, and got the carpets professionally cleaned, I scrubbed one wall that was covered in hand prints from when the kids were small, and I cleaned all the glass windows and sliding doors and tracks, then we had to put all the furniture back! It was a big day, but the room looks and feels so clean! Tomorrow we get to put up the tree in there. Well done! Everything done before it gets really busy is a bonus! It is so handy having cakes set aside for visitors. I do this here at the farm as anyone who turns up has travelled so tea or coffee, cake etc comes out. The cakes are heavy! 2 k is a lot!! According the the bakery prices they are worth a fortune! How nice to have fresh cleaned carpets. Also clean windows make so much difference to a room. I notice this so much. Like the world got brighter! Annabel you have been so productive for the week and accomplished a lot :). Incidentally a tip is that you can put a bay leaf in with your flour and grains to stop weevils too, just use a few for 10 lt food storage buckets. J and family will be in our continued prayers as will Maria's daughter for a safe and uncomplicated baby delivery. Our Vicky challenge added up to $4351.71 last week in savings. - Packed more boxes in our home and cleaned areas as we went. - Pulled up the last of our vegetables from the gardens and a friend levelled them for us free of charge with his tractor. What a blessing this was instead of doing it manually as he was grateful for help we gave him a few times in the past :). - Mulched most of the gardens with grass clippings from our yard as well as the neighbours grass clippings too to get rid of them. we also have some to go under the house where the weeds grow too to make it nice and neat. - Saved $3100 in stamp duty on our new to us home by applying the home concession rate offered by the Qld Government for buyers using homes as their primary place of residence. Our solicitor was kind enough to let us know about this and we filled out the forms in their office. - Got multiple quotes for house, contents and ride on lawnmower transit insurance and saved $443.18 per year compared to another quote we got. - Bought $325.60 worth of groceries for $200 saving $125.60 on usual costs in total. We used a $40 off purchase e-voucher, coupled that with $10 off we earned for rewards by buying what we usually buy and purchased lots of half price specials on items we usually use saving $75.20. - I did a years supply order of herbs, spices and about 1 yr + of yeast from Hindustan Imports in Melbourne and even with shipping I saved $98.75 over what it would have cost to buy it all in our local supermarkets. I do this a lot and bulk order from various capital cities in Australia and it saves us hugely on lots of needed household items and groceries throughout the year. - DH's battery went in his car suddenly and we saved 20% off usual prices or $39 by using our roadside assistance club discount. - Purchased 2 sets of heavy duty 1200 Amp 6/12/24V 6mt long sets of jumper leads off eBay saving $546.18 over buying them in the local auto store. We wanted to buy the heavy duty ones so we could start any machinery, trucks and cars with it. I was absolutely gob smacked at the prices our auto stores are charging for jumper leads :O .
I hope everyone has a wonderful week ahead and find some ways to save leading up to Christmas. Dear Lorna, You had a huge week! What savings!! The help of the tractor wold have saved so much work. That was fantastic. I am glad you know about the stamp duty. That was a big saving for filling out one form! Cath on Cheapskates mentions Hindusan Imports and they sound amazing. I did not know they post!! That is a big savings even with postage as you say... I am going to check out their prices. I have had a shop in Adelaide but I felt their prices went up so I am going to compare. Thank you! Thank you Annabel and yes the stamp duty discount was a huge saving and we are really looking forward to getting into our own home and it isn't long now only 11 days away. With putting in an order for Hindustan Imports you put in your order and then they ring you after they have confirmed they have everything in stock and the postage cost as well. Then you can either accept the postage cost they quote or if you can get it cheaper with postage more locally to you ( I preworked out the savings before ordering), you can cancel the order with nothing lost but greater experience. They post via Australia Post and via courier, the courier being a slightly cheaper option. Hoping the added information will help you. Most welcome Maria and I hope all goes well for your daughter. Hi Lorraine thank you :) we are thrilled. I will see if I can pop you and email later today with pictures of the property we are buying so you can have a sneak peek at it. Such a wake up to see the price of those fruit cakes, wow! What a blessing on the future cherries and figs, and girl, those roses...swoon. Feathering my nest is mostly cooking from scratch every day, but I'm propagating loads of plants in the garden (as is my man) and having incredible success so there will be a few friends receiving potted plants for Christmas, not to mention to $ we're saving by not buying from the plant nursery. My husband and I drive around early Saturday mornings and with the secateurs he takes cuttings from trees and plants along parkways and roadsides, then he prepares them for propagation and pops them in his two homemade greenhouses until they take root and are ready for transplanting. This is also how we're filling out our tropical garden. I went through all my old recipe folders this week and culled a LOT, keeping only the ones we know we love. From there I'm preparing a few 'family favourites' recipe folders for my daughters, with handmade stitched covers for Christmas. Our homemaking is worth a fortune in more ways than one! With the price of plants propagating is a great thing to do. Plants are a great gift. I look at plants all the time and the prices often are shocking. I am learning to use more seeds and going pretty good. I saw you want succulents. They are wonderful and propagate so well! Very often in Adelaide I could find lots of plastic pots on the roadside and grab those for getting things started. Also I would enjoy the drives looking for things to take cuttings from! It's been a while since I last commented but I have been reading along and enjoying hearing about what everyone is up to. First of all, all the best to Maria' family for the upcoming birth. Also I am sending much love to J and her young daughter and family.I have a lot of understanding and experience with some of what they are going through. Trauma is so, so, difficult and not something you can just "get over." Annabel, Chloe and Luke's wedding looked so beautiful. What a wonderful day and memories made. It is clear both Chloe and Lucy share your good eye for creating beauty and style. I am so pleased you have had a better week. Sometimes life can be very overwhelming. I hope your mum is doing well. Your parent's seem a lot like mine. Really good, kind and decent people. I am so lucky that mine are in good health at 76 and 82 respectively. I forget that they are supposedly "elderly." My new job is going really well. I have just signed a permanent contract which will begin in February when my current fixed term contract ends. It took 3months to find the right job for me and I feel truely blessed. My new colleagues are wonderful, kind, fun people. For our xmas gift our boss has given us all a paid day off before Christmas. I was blown away at her generosity but this is fairly typical of who she is. After the sadness of the last twelve months in my other job I am so, so fortunate. Dear Mandy, Hello! I am glad you have been reading along. Your parents are very close to my parents in age. Dad is 81, Mum 4 years younger. I am so glad about your job and lovely boss. That would make so much difference to life! Also that you have a permanent contract! Bushfires are shocking. We have a high fire danger day tomorrow but I am not too worried as rain is coming and it wont be overly hot. But summer will be here tomorrow and we are sure to get some terrible conditions. Mandy I am so happy you are loving your new job and are happy there :). It can be very traumatic working in a job when it is a challenging work environment as I have been through that in the past too. Mandy, I am thrilled that you have a new job and a wonderful boss, as you have already experiences in your work the opposite is not very pleasant. Thank you so much ladies for your kind and supportive words. Considering we spend more time in a 40hr week at work than home, toxic people have a huge impact. Never have I experienced it at this level before. The person has now left the job and a trail of destruction behind them. There has been a lot about this type of person and bullying in the media lately. Many people have talked with me about their own experiences of these situations. I am greatly hartened by the support. wow those fruit cakes are expensive! 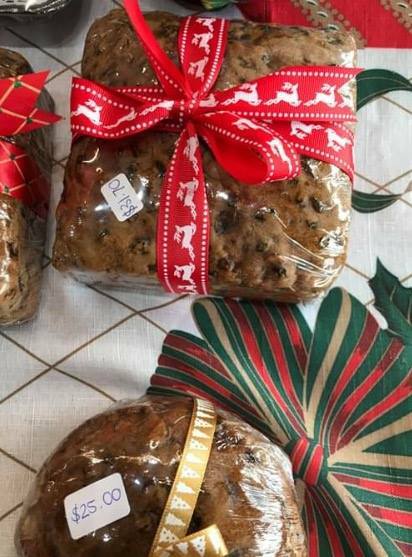 i buy mine every year when i can, i like to buy the Lions christmas cakes as i think they taste best, though nothing compares to a home made cake. the Lions i bought cost me $18.00 for a 1.5kg cake in a lovely gold tin. i've bought 3 of them. my gift giving needs a lot of work still, this year so far i only have shopping bags I bought from our local markets from one of our market members; i like to try & support local where possible & since the plastic shopping bags have gone i thought fabric bags for gifts & have been collecting them since July. had hoped to get some dish cloths & hand towels made but haven't a chance there yet as still knitting a commissioned cardigan. a farm full of roses & fruit trees, awesome! can't wait to see it! Dear Selina, I have some of those lovely tins!! They are so useful. I love what you are saying about supporting local business. I love supporting home businesses. there is still time but it you are working on a commissioned cardigan you must be a wonderful knitter. I would love to see! Dear Annabel,it was so lovely to hear that J is home and showing improvement, and continues to do so , love and healing to J and J and family. Your jam with that sweet baby rose is gorgeous!Your gifted Owl certainly looks the part of guardian. 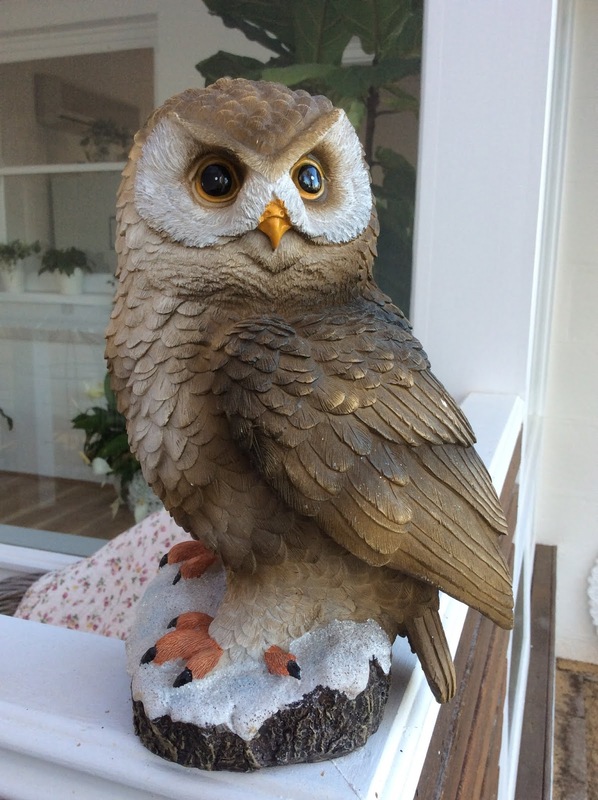 I have just bought 3 gray owl faces that are solar lights for my small garden. 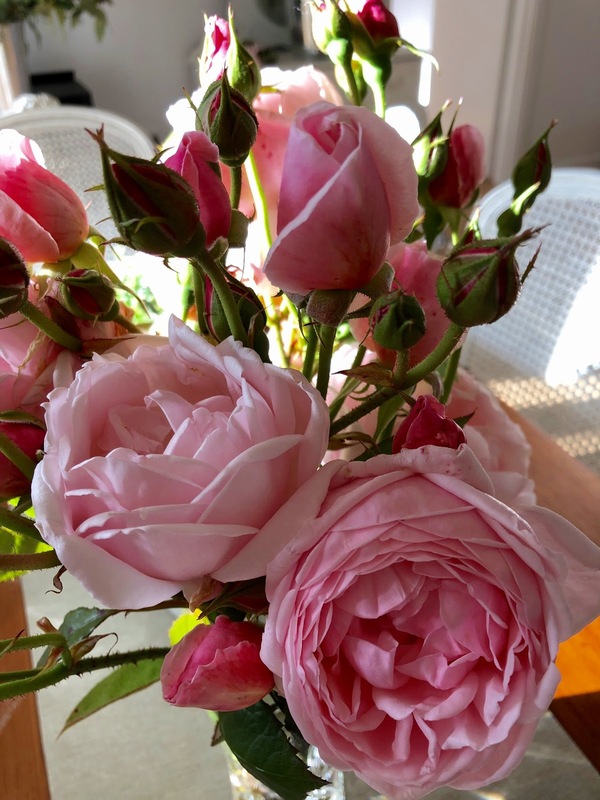 And those beautiful roses are so soft in colour too.I did not know Lucy and family had made the decision to move too ,their new homestead sounds grand with all those roses, and fruit trees galore.You will really be in your element floating between family farms and homesteads now hehe. Annabel , your gifts look perfection every time , I need you here to help me , Im slap dash sort of gal. Thankyou for mentioning my daughter , we all appreciate yours and anyone's prayers at this time . She has had such a miserable pregnancy, on top of everything else .Her children , though young have been so good and helpful , yet Ive worried about the impact on them .Rollon Friday !or sooner, god willing. Enjoy the Christmas market with Chloe and hope you find some great bargains and new things of interest . My week has ticked along , I made lemon curd with a couple of lemons a friend gave me,and I give her the lemon curd back as she pays my pool entry when we go. I did my daughters hair to save her at least $60, and though tired she said she enjoyed the pampering. I wrapped my 3 adult children and family's presents and several friends . Put up the Christmas tree ,and then another as Id bought a new one for next year but my little grandchildren were so excited that I had two , that lead to a big cleanup in the back area to make way for the old tree . I added more plants here and there to our small garden areas,trying to keep ahead of myself before the new grandbaby arrives.This time next week it will be here ! Dear Maria, I know tomorrow is the big day! I know the feeling of both nervousness and excitement. I hope this time tomorrow (9 pm here) you will be able to relax with wonderful news. Lucy and family took a while to decide... but now looks like move late January. This places them nearer than now but still a fair distance.. Soon I will be travelling south instead of to Adelaide regularly. The garden has so much I will be picking stuff every trip as it is kind of rambling and old fruit trees etc. Well done on getting the presents done. As it gets busier... let alone with a new baby added in... you will be glad! Firstly, I am so glad to hear J's daughter is home from the hospital. I will continue to keep her in my prayers. And Maria's daughter, too! Next, I just want to say "Wow!" You have accomplished so much this past week and the photos are all so lovely, I could be here all day commenting! :) I am excited for Lucy and her family...those roses are divine! It sounds like you will have lots of fun with Chloe at the Christmas market...I love that kind of shopping. 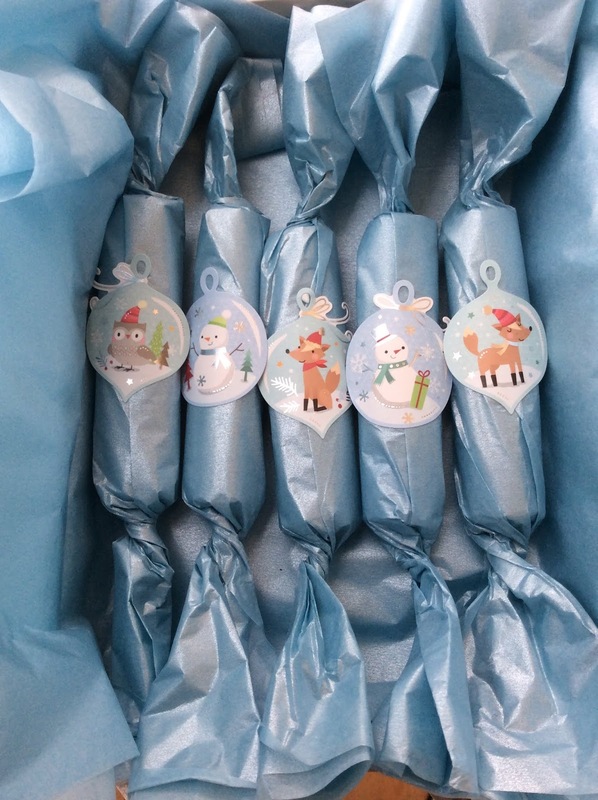 All your photos of lovely wrapped gifts and bay leaves and even bakery fruitcakes are getting me in the Christmas mood! It's hard to believe it will be December tomorrow already! My eldest won't be done her uni exams until the 18th, so we're trying to tone down the festive feeling somewhat so she can stay focused on the work she still has to do! Ha, ha! Must go and get started for the day, but want to wish you a wonderful weekend! Dear Jen, Sorry for a slow reply! We went to the city and this set me back time wise. Thank you re the week! I love to feel stuff was accomplished. Hi - I live in the United States and can not imagine having a kangaroo in the front yard just hopping on by !! I love your blog and enjoy reading it very much ! Annabel, what a lovely post! I, too, am glad your week has been better. Those roses are just too gorgeous! I am on a hunt for fragrant varieties to plant so if anyone knows of any, please let me know. I have been praying for J and her daughter and now will add Maria's daughter to my prayer list. Looking at the prices of those cakes makes me realize all over again what a savings living a frugal DIY lifestyle is! Patsy if you can find the old Floribunda roses they are the most fragrant and are not grafted so you can propogate other roses off them through cuttings. I hope this helps and I prefer the older varieties mostly as they are unadulterated :). I dried the roses that were left as they started to wilt. They were the nicest scented roses I have ever had. Thank you for your prayers for the girls... very much appreciated. Annabel, I'm really curious to see what you do with the sacks. You do plan to share the creative twist you put on them, right? When you said your whole family was moving to the country, I imagined you would be neighbors. I know Australia is gigantic, so does 2 hours away count as next door? I'm not going to complain any more about the hour it takes to go see my grandsons! I haven't been as productive as you, but I've done some baking. Overly ripe bananas and crushed pineapple went into hummingbird muffins and I made sweet potato bread from sweet potatoes from the garden. The pantry is organized (unfortunately, the fridge is not)and the freezer is inventoried. Almost finished crocheting a small throw rug for the bathroom floor. My whole week is condensed into a couple of sentences. It sure felt like I did more! God bless J. and her family. They continue to be in my prayers. Dear Phyllis... I will share!! I do have plans.... then Chloe saw them today and said she likes the numbers they kind of have an industrial vibe. She is right. So I will make some over and leave some too. Haha ok two hours away isn't next door. So Chloe IS next door and it takes me 7 minutes in the car... so a few miles? But we are literally neighbours as one property meets the next. Dad has this far flung place that is lovely but no not connected at all... I do wish it was closer. However it is closer than where they are now. So life will change from traveling north weekly to south! I LOVE hummingbird cake. Good idea on making it into muffins. Yum. I love sweet potatoes too. Do show me the bath mat. We would say bathmat... it is funny we often have different words or expressions. Mainly bath mats are ugly here so a hand made one would be very nice! Annabel, I am only just this week catching up with you. I am so sorry for whatever worry you had. And equally sorry for J...I wish I had been able to join in on prayer. I had a week in which plans were constantly changed but it did not stop me getting ahead. I made four and half pints of yogurt, put a small lasagna in my freezer (by the way a 9x13 pan of lasagna sells for $50 at a local pizzeria here in my state), made a big batch of spaghetti sauce and set a quart aside for the freezer and much more. It was a busy week overall but I managed to do a bit. Dear Terri, Well done!! Thank you also for your kind words. You are always very industrious! Even when busy or stretched there are ways to get ahead! If making something make extra is one of my easiest ways to get ahead. Lasagna also sells fro crazy prices here. It was $15 per slice in one place that sold them whole or in portions. Now I let mine go cold then slice up into serving sizes. I seem to get many more meals this way and when its cold it slices nicely. I need to make some actually as normally I keep some on hand. I am so glad you have had a better week! It's wonderful to hear that J is doing better, too. I will continue keeping them in my prayers and will add Maria's daughter.How nice that you were given all the little cloth bags. Knowing you, they will be turned into something lovely. I am the only one in my family who likes fruitcake. I sometimes buy an inexpensive one and sometimes make fruitcake cookies, but I can't imagine paying that price. Lucy's new home sounds wonderful with the roses and fruit. I'm sure you will have fun exploring the area together. We had a lovely visit with our son and family. I picked up a few more gifts while there, which they opened early so we could see. One of the gifts I got our granddaughter was a dress form about the size for an 18 inch doll. Our DIL spotted it and mentioned she had been looking for one for Hannah..They had enjoyed designing clothes by clipping fabric pieces on something similar at a museum they visited. I was even able to use a 50% off coupon. Hannah was thrilled to receive it and we were thrilled to see her so excited. I plan to look through my fabric for some pieces to send her. I love that she will be using her creativity and learning more about sewing. I even have a piece of pretty green satin left from repairing her mermaid tail blanket. She was pleased with my repair on that, too. Dear Elaine, Thank you for praying for J and Maria's daughter. That is very much appreciated. I am glad you had such a nice time with your son and his family. What a beautiful present. Maybe you will encourage a future dressmaker! Yes fabrics would be great now... she maybe able to start some hand sewing... these are all great skills to start working on. I was mad keen on sewing when I was little. At one point I was banned fro sewing in bed lol due to the obvious hazards! 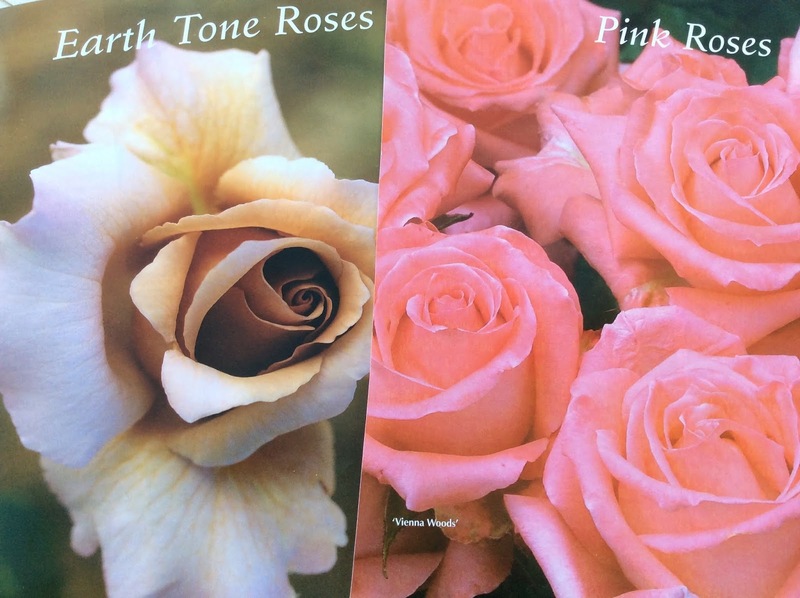 Those roses are truly fabulous! It is so fascinating to look at the workmanship in the flowers that God put on this Earth for our enjoyment. And the fragrance! We so underestimate how much He cares for us. It is wonderful to hear that Lucy will be moving closer to you. We continue to search for another house but it is putting us behind on everything for Christmas. We were blessed by many great deals and freebies at the grocery stores this week and have prepped many foods and put them away in the freezer for when the family is home over Christmas. Dear Lana, I have always thought that roses and their scent and other stunning creations like hummingbirds and blue wrens etc are a glimpse of heaven. Like signs of hope. I am swept away by these things. I am hoping things are going ok with your Mum and Dad? I hoped nothing would change your moving plans... Keep at it and pray as I KNOW the right place will be provided. I had a message from Mary when I was moving and she said this is no problem for God... the God who holds up the sun, moon and stars ... this is easy for him!!! I loved that and hung on to it. My Mom is home and working with a physical therapist at home 3 days a week but she has recovered so quickly that it has to be prayer. She is back to her feisty self! We are trusting and leaning hard on God for the move. We can see Him at work and He has closed a door firmly on a house that we really thought we wanted in the last week. Now we can see why. He is so good to us and will accomplishment it in His time. It is wonderful to rest in His care because this all seems so overwhelming and impossible. Hello Annabel, your life is just so interesting isn’t it? Great time to be settling in somewhere with those lovely markets. Glad J is home, hope she is able to grapple those demons. Such a terrible time for them. And Kelley, troubling news about your husband. Hope you can work something out. Maria, another new baby shortly, I’m sure everything will work out well. We are also flying to Tasmania like Cath is ( you will love it). Just in and out for lunch, so a big day but can’t not see my son, his wife and my baby grandson. J is doing well. We are claiming that demons seriously cannot cope with prayer or the Word of God. So we are keeping on that as God brings peace, calm, hope... now I also have to remind myself of this everyday! 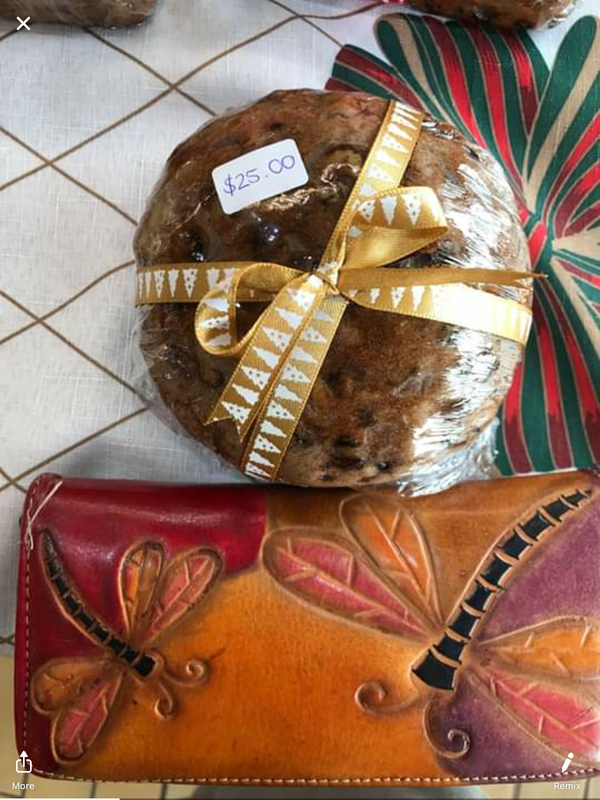 Who in their right mind would pay that much for a fruit cake?? Insanity! First continued prayers for J and Maria. You have had a wonderful week the roses are beautiful and so is your jam. It is the simple things that make life good most times. We saved $350 on the well drilling for paying cash. Hopefully the rest will be finished soon. I set out buckets when it rains to catch extra free water. It comes in handy for sure! I got a $10 Kohl's gift card all I have to do is buy something and share it on my fb page in return. I got samples of baby body wash and a tote in the mail. I saved 3 stamps paying bills over the phone. The cost of stamps is going up again. I received a bottle of topical pain reliever to review. The cost for this at the store is $18. I got a free carton of broth and a free candy bar with coupons and at the store I got a free sample of M&M's. Those little samples make great stocking stuffers. I brought home 4 free books from the laundromat. I have made several use it up meals or cook once eat for a few days meals. I started crocheting a bath mat, but not sure if I will get it finished in time to gift this year. I have small wastebaskets I got for free from Kmart and want to fancy one up to go with the bath mat as a gift. Todd is bringing me another small tree this year he loved how I did the last one. It was simple with just things from the yard. I have brown paper again to wrap the little gifts that will go under it. I just love it! I picked up 30 pounds of corn that had been spilled down the road. It's shelled and dried already so free chicken food. We have been burning wood on the cold days and it's still wood we got for free plus good sized sticks I had collected and cut up to use for kindling. This saves us a lot in the winter. I don't miss those big fuel oil bills! Ive cashed out for any gift cards I've earned this year. I didn't earn that many this year, but boy this has been a bad year. I know the new year will be better. Dear Vicky, At last I can reply!! You will be wondering about me. I went to the city... I will catch you up on everything but start here. The savings are excellent. Yes the simple things can be the most lovely. I love that you are making a bath mat... so is Phyllis I just read. I love pretty ones. I would love to see your tree! Vicky the fact you picked up that corn was great. Corn is good food for the animals in winter. And you got a lot!! It is very good too you have a good wood supply. You do great on your gift cards!! This all adds up a lot!! I know you will get good value with them too! Feather your Nest Friday, 23 November, 2018. Catching up on Show and Tell. Last one! Catching up with Show and Tell, Part 6. Catching up with Show and Tell Part 5! Feather your Nest Friday, 16th November 2018. Catching up with Show and Tell, Part 4. Catching up with Show and Tell, Part 3. Getting back to Show and Tell part 2. Getting back to Show and Tell at last! Feather your Nest Friday, 9th November 2018. Feather your Nest Friday, 2nd November. 2018.